Jesse Woodson James was born on 3 September 1847 in Clay County, Missouri, USA, the son of a Baptist minister. In 1864 he joined a guerrilla outfit led by “Bloody Bill” Anderson but was wounded in the chest when they met a Union patrol. His cousin, Zerelda Mimms, tended him and they married nine years later on 24 April 1874. It seems likely that James took part in the first armed bank robbery in the United States in peacetime. On 13 February 1866 the Clay County Savings Association in Liberty, Missouri, was robbed. However, some believe that James was too ill to participate. In 1869 Jesse and his brother Frank robbed the Daviess County Savings Association in Gallatin, Missouri. The following year, Jesse began his PR campaign, writing to the Liberty Tribune claiming that he was being persecuted because of his political beliefs, not his criminal behaviour. Over the next ten years, Jesse James often appeared in the press with testimonials from public and politicians sympathetic to the South. On 21 July 1873, having joined up with the Younger brothers, Jesse began robbing trains, stealing $3,000 from the Rock Island train in Adair, Iowa. During a robbery in 1874 a press release, exaggerating the height of the outlaws, was handed to passengers to give to the media. Jesse did his best to portray himself and his gang as modern-day Robin Hoods. On 26 January 1875 detectives from the Pinkerton Agency raided the James home and in the rumpus Jesse’s nine-year-old brother was killed. Politics became a major tenet of the James legend: Republicans blamed Democrats for supporting banditry while Democrats condemned Republicans for slandering the James brothers. 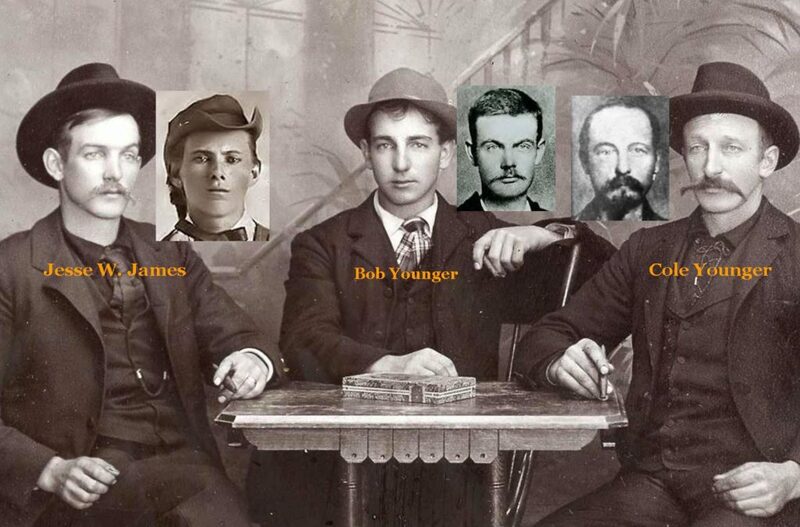 In September 1876 the James-Younger gang robbed the First National Bank of Northfield, Minnesota. It was a disaster — three robbers were killed, and three Younger brothers were wounded and captured. Only Jesse and Frank James remained at liberty. Jesse went back to his wicked ways in 1879, forming a new gang but it soon disintegrated. Jesse trusted just two men: his brother Frank and Charley Ford. Charley Ford and his brother Bob moved in with Jesse and his family. Bob Ford had been negotiating to capture Jesse and claim the $5,000 reward. However, on the morning of 3 April 1882 while Jesse stood on a chair to do the dusting, Bob Ford shot him in the back. One obituary described Jesse as “the most renowned murderer and robber of his age”. Six months later, Frank James surrendered. During one train robbery, the gang examined the hands of the passengers so that working men would not be robbed.